The University of West London (UWL), voted the best modern university in London (2013 Guardian University League Table), has been undergoing a dramatic refurbishment. 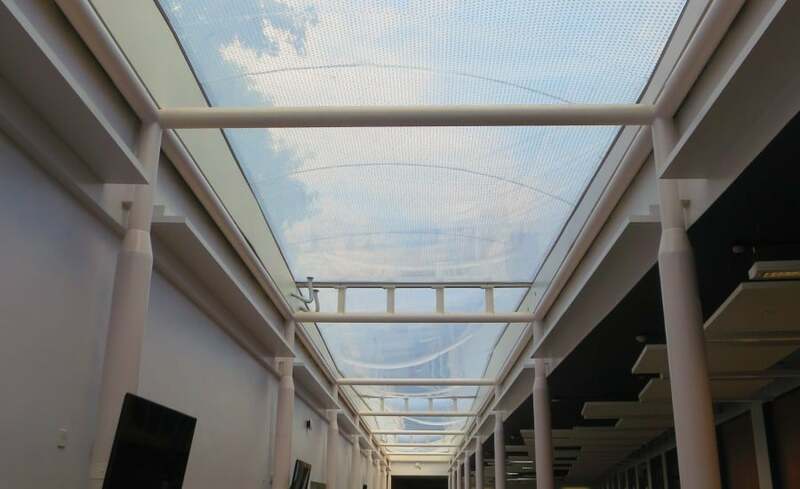 Part of this refurb entailed a bright new ETFE roof over a fully enclosed education space. 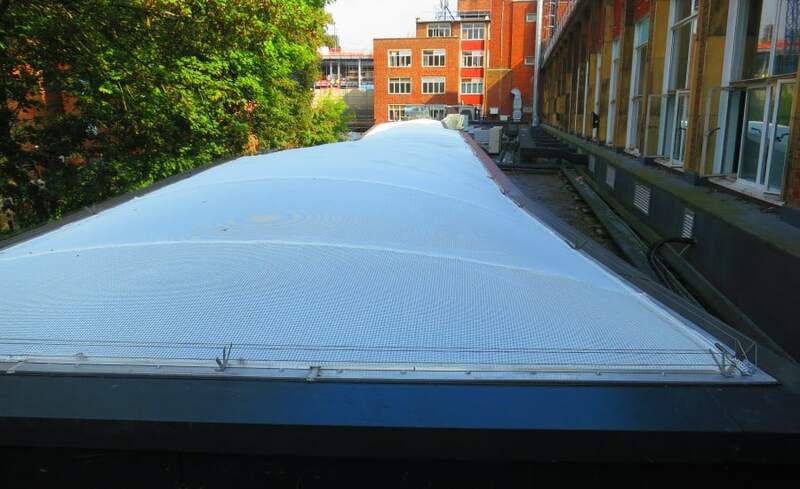 Working under a very tight deadline, we had one week from which to remove the existing ETFE cushions and replace them with a new three layer system. Luckily, we were able to reuse the existing air handling unit, pipework, track and steel frame – this allowed us to fast-track the project. Once the cushions were installed, we then added a new silicone seal around the perimeter of the system and installed bird wire cables to protect the system. The previous frit on the cushions allowed for 32% light transmission. UWL decided on a 16mm dot frit pattern on the new cushions which increased light transmission to 56%. 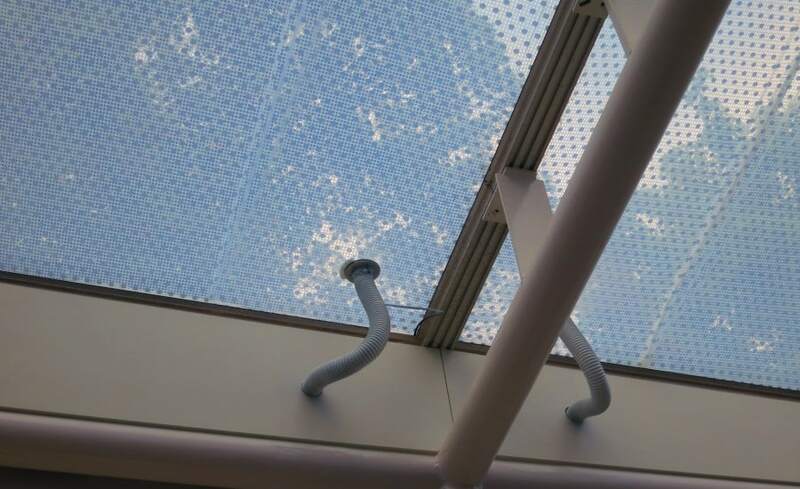 This new frit, when combined with the acoustic rain suppression mesh, offered the required increase of natural light to the space below. The addition of a rain suppression mesh was installed over the top layer of the cushions. This allowed us to reduce the noise from rain (in what’s known as the ‘drumming effect’) by 10 decibels. 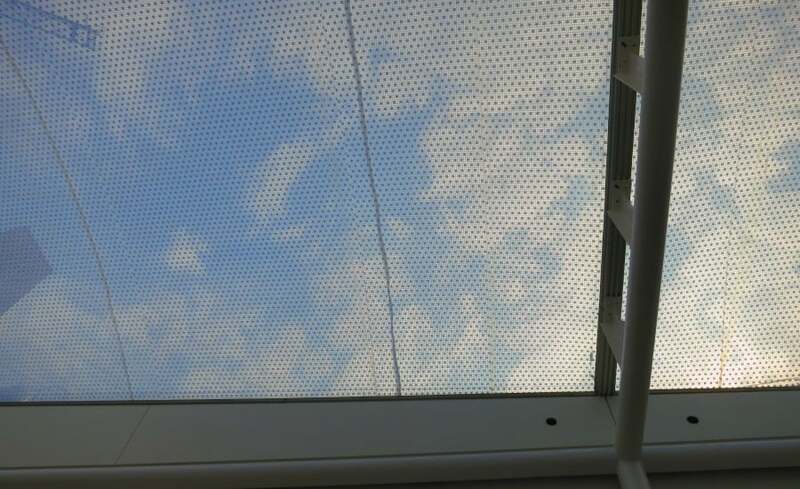 In addition, the mesh dramatically reduced the solar gain which keeps the space below cooler on sunny days. A three layer system was specified to improve the thermal properties of the enclosed space. The previous two layer cushions achieved a u-value of 2.94 versus the new three-layer cushions which achieves 1.96. The result is a new roof system that is brighter, cooler and quieter. Thanks to our construction partner, Willmott Dixon for their support with the project.